Yes, yes, we are still talking about the 13th birthday party that was epic! Read Part I and Part II, lest you feel a tad bit lost in this post. 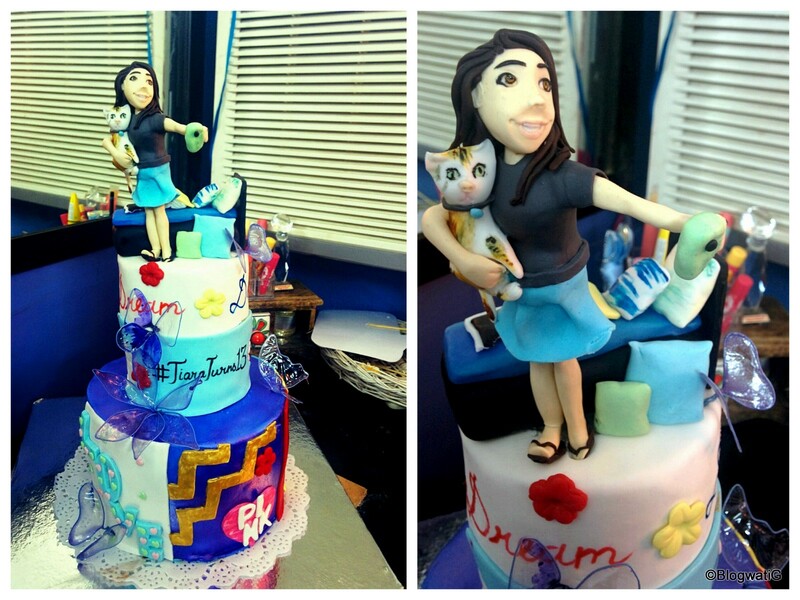 So, the last post covered one part of the photo backdrops, while the post prior talked about the invite and the cake. This one is going to take you through the rest of the party, finally. The academic year 2014-2015 had been a game changer in many ways for these girls. Quite a few were changing schools, some moving towns and a few newbies had arrived too. 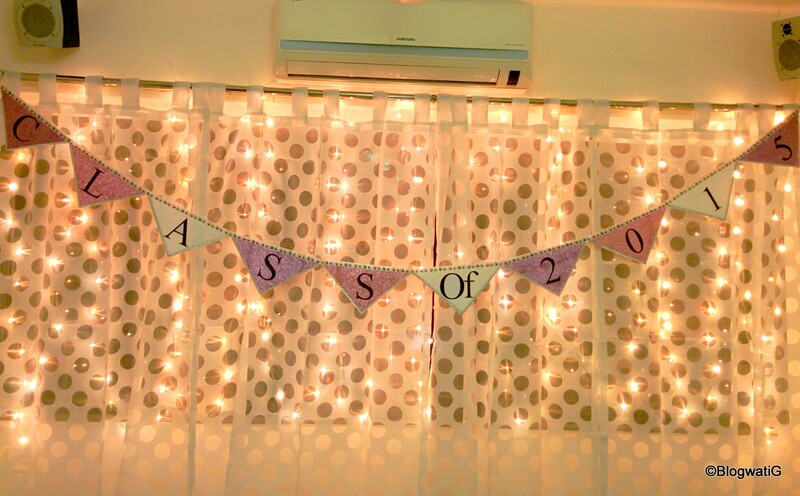 So, a class of 2015 banner seemed ideal. I made that on glitter paper strung on a satin ribbon. The letters were printed at home and then cut out and pasted on to make the banner come alive. The sheer curtains accompanied by fairy lights gave the famed Bokeh look to the pictures clicked. Nice, eh? Yes, me thinks so, too! The back of the door was decorated with pop up stickers for a Paris-London-New York look. With that the count of photo backdrops was a whopping 7. 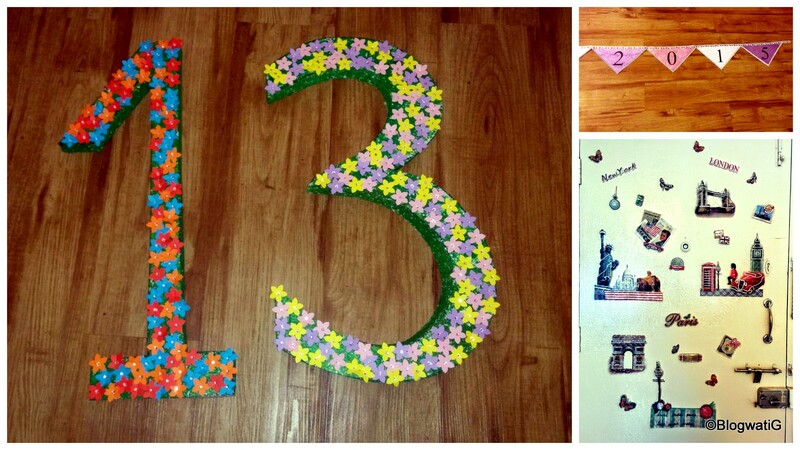 I also made a number 13 cutout of thermocal, decorated with punched out flowers and diamante. Picture frames cut out of Sunboard were the ideal add-on for the Instagram party. 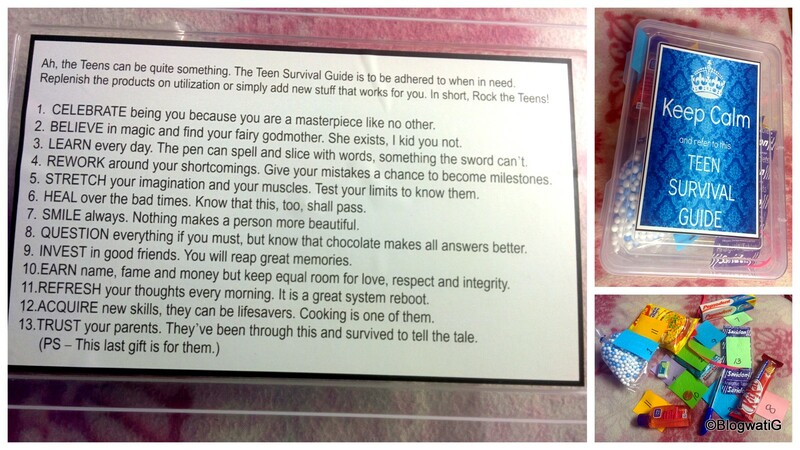 A handful of Teenager Posts were printed and laminated as additional props. And after toiling for a week or so, we were set to rock and roll. The 13th Birthday Party day arrived. The girls walked in, looked around and needed no instructions. They aced the Instagram party to the maximum with a click here and a click there. I think the amount of selfies clicked that evening could have been a record in itself. They helped themselves to the food and drinks and simply had a rollicking time. Thank god, I did not invest in that game host. 😉 And remember the cake? Well, yes, the girls told me it was the best cake ever. And I totally agree. Thank you L’il White Oven, once again. The princess said this was the best party ever. Her girlfriends didn’t leave till 11 pm coz they were having too much fun. We welcomed the teens in style and I was declared a rock star mom………yes, all was well with the universe. So, I am pretty much done with words in this post, ergo I am going to leave you with a few snapshots to seal the deal. Let me know what you thought about my event management skills. Clap clap clap for a rock star mom and her event management skills…shall we both start an event mgt company? :P. You did it just right. You didn’t over do or under do it. Now I think I want to write a post for the housewarming party that’s gonna happen this wknd. I will if it is as successful as yours 🙂 btw, princess is a beautiful girl. God bless her. That was quick Prudhvi…..but am I glad. And I really can’t wait for your post to be up, especially considering the little package voyage that took place. I am reallllllllllllllllly intrigued. Do write. Thank you for the wishes, shall pass it on to the princess. 🙂 There are so many voyages, Vinita 🙁 Tomorrow is the big day and the weather prediction is rain. I have 80 adults, 40 plus kids as guests and have to cramp all of them inside. 🙁 Tired of the continual stress surprises. ahhahaah!! Love the pics; especially the one with the pink moustache!! Oh yeah, the props were fun, too. Some made, some borrowed and some bought. Next year…………..pizza party for sure. Or maybe the cake, samosa, Rasna one? So so so cool! Mai to padhne mei hi thak gyi. How did u ever think and then, execute so much? Ghata recently posted…Real Life Heroes and their #WillOfSteel ! Ha ha ha ha Ghata, jab plan kar rahi thi, tab nahin laga…………par likhne main main bhi thakk gayi….lol. What a wonderful party. I loved everything and zoomed on every single photo to see all the beautiful details. You rock! And I am so glad you did that………..it is the best form of appreciation, you know……seeing the tiny details. Thanks sooooooo much, Saks. Wow! Outstanding event management and creativity! It gets harder and harder to please the kids as they grow older, and you definitely nailed this year to the TEE!!!! Welcome, princess Tiara, to the teen world! Hugs and much love! Thanks, Shachi. I wanted it to be special for her this year for many reasons, and I am glad I could pull of this Herculean task. Will pass on your wishes to her, for sure. Bhagwan aapke jaisi Maa sabko de ! Your creativity rocks Vini. Your excitement as you prepared for the party was contagious and I was all keyed up sitting here in Delhi ! 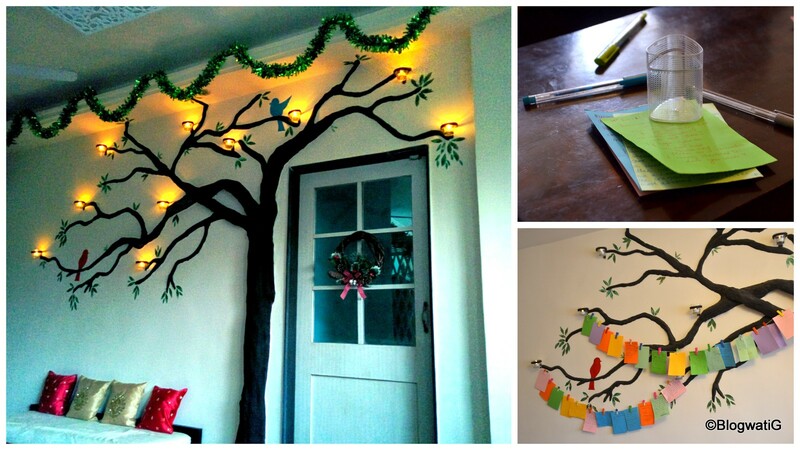 I loved the pen your memory – paper flag idea a lot ! And I Absolutely love the Teen survival guideAnd the flowers were so pretty … and the corner with the communion dress and the cage with lights. Oh hell I love it All ! Ah, yes, Ruch, you were my partner in ‘deed’ as I shared the work done by me. I just was too excited….and yet could not let on the world on the goodies beforehand. You are hugely talented and so creative. That was a great party you pulled off. Well done! Awwww Rachna, you simply love me too much. But yes, this was the mother of all parties – you can say that again.